"We shall fly them to the beaches, we shall fly them to the hills, we shall fly them to London!" serious or widespread offence or promoting further distress. 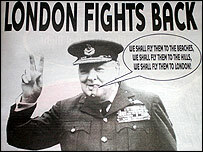 Londoners in the days that followed the terrorist attacks." Quite right, in my humble opinion.